Dogs’ noses are truly remarkable: the average dog has a sense of smell 100,000 times better than the average human. A dog’s brain has a much larger area dedicated to the sense of smell than a human’s, and dogs generally have between 125 and 250 million smell receptors. The Bloodhound has 300 million smell receptors – and the average human a measly 5 million. 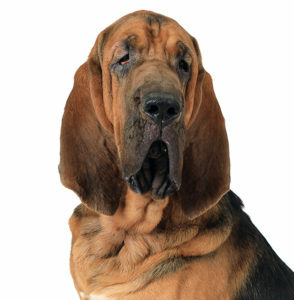 Bloodhounds can smell things up to 40 feet underground, and smell if a human touched something several days – up to a week – earlier. Another interesting fact about dogs’ sense of smell is, they can smell separately with each nostril, and this helps them locate the source of an interesting scent. They also have a special scent-detecting organ – the vomeronasal organ – that helps them detect pheromones.